Early in the season, my friend Cam and I were discussing spending a few nights at a backcountry hut sometime over a beer or two. We knew that Alpine Club huts, while spectacular were expensive and quite large, meaning sharing. 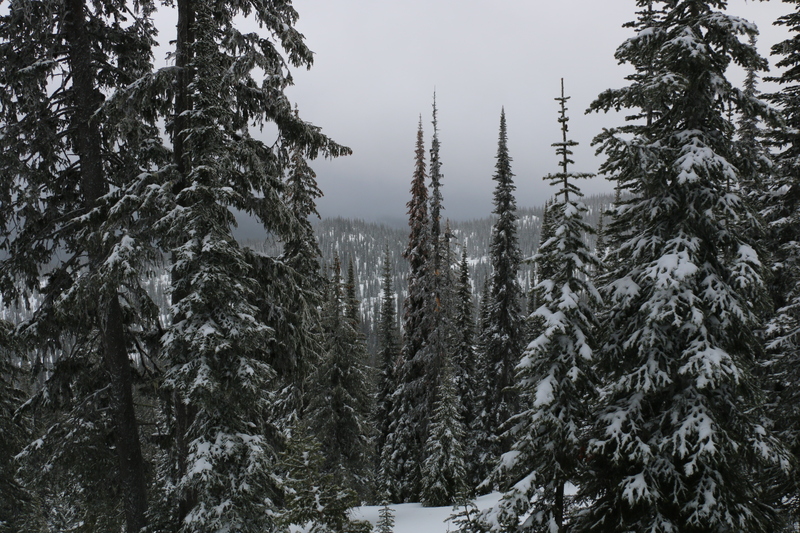 We decided immediately against spending much money or allowing the possibility of being stuck with someone we didn’t hand pick and went with the Creston Valley Quad Squad hut above the summit of the Salmo-Creston (Kootenay) pass. At 10 dollars per person per night, we just went ahead and gambled on two nights in February that we thought might be decent. On February 11, I packed up my ski gear in a hurry, as I often do and hit the road to Invermere to pick up Cam, who was waiting awkwardly and hilariously in a Subway, sandwhichless and earning mean looks from the manager with his gear all over the floor. A second stop at the Cranbrook Superstore for supplies and an early lunch had us into the pass around 3:00. After encouraging condition reports from people returning to the parking lot we geared up, shouldered annoyingly large packs and trudged up a nice skintrack toward Ripple Pass. The track itself is an easy find as it follows a road of some kind nearly the entire way. Heavy packs aside, we enjoyed the early evening quiet and gleefully discussed the snow and terrain we were skinning through. After 3ish km we hit the top of Ripple Pass and from there it was only a few minutes to the hut itself, which is reasonably well signed. Though we didn’t take any photos of the interior of the cabin, it is very nice, if smallish. Comfortable for up to four I would say. The capacity of 6 on the booking page assumes the occupants to be uncommonly good friends, and certainly not claustrophobic. A nice view, woodstove, eating area and sleeping loft are plenty to make a cozy base camp. We were happy to see that a massive snow melting pot was available and a hand drawn map on the wall laid out dozens of skiing options, which would be handy the next day with no more than 200m visibility. The next morning dawned to a soundtrack of avalanche control bombs back at the highway and windows rattling in the wind. Roughly 30cm of snow had fallen overnight, although it was obviously being hammered by some sort of inland hurricane. We poked our heads out, regretted it and immediately decided we were in no hurry to go skiing. The wind finally relented a little by mid morning, so “no time like the present”, we decided and out we went. As suspected, the new snow had a slight wind affected quality and sat on top of a fairly touchy crust/facet combination. (This layer would, tragically prove fatal within a few kilometres of the hut several days and another 60cm of snow after our departure.) After digging a pit and doing some assessment, we decided to stick to the lower angle treed shots near the hut, which suited us just fine, because they were awesome. Perfect natural glading, sheltered and still decent snow with a great pitch. “We could do this all day!” We said. So we did, eventually returning to the hut in the dark. Our final day was spent similarly, and although the pall of having to pack and leave hung over us, we had a killer day, this time in the sun. By this point the pass had reopened and we enjoyed not having to break trail every time our skins went on. The few people we ran into commented on our luck at having chosen the days we did. The new snow was making for fantastic skiing with manageable risk, something that, this year was proving unusually elusive. Packs now considerably lighter, we retrieved all our gear and headed back to the highway, enjoying great tree skiing nearly the whole way down. All in all, an awesome experience and one that I highly recommend to any backcountry skier. (Book the hut here.) The cabin is easy to access, cheap, comfortable and well located for a few nights of peace, quiet and great skiing. We will certainly be back. I really enjoyed reading your blog. It is nicely written. A little bit of inside information for you…The Ripple Ridge Cabin is no longer managed by the likes of the Creston Valley Quad Squad, but is under new management by the Ripple Ridge Recreation Association. There is also a new second cabin called Lightning Strike Cabin, which is located only 50 meters form the other. The new cabin is set up for eight (8) people. Both cabins are available for reservations at rippleridge.ca and cost is still only $10 per person per night. Thanks Mike, appreciate the update. I still get a decent amount of traffic on these posts so it’s great to have the most up to date info. The new cabin looks awesome!